I will make yam and goat meat peppersoup. Then carry the pot and the lion and cross the river. Carry the goat first,then the yam. When I drop the yam I will take the goat back then carry the lion and go back and carry the goat. Lafresh, you are a wise woman. I first of all boil the yam and eat(when i see my fav food) inukwa!...Nna no time. Then i carry the goat across and come back for the lion. I will take the goat to the other side bring the yam next,make miri oku ji ie goat meat and yam peppersoup enjoy my life then leave the lion to find it's way because the lion fit vex chop me if e no see the goat again! twist of fate. You were trusted to come up with an algorithm that will eliminate shortage of any form. instead, You ended up eliminating the yam 😁😁. You are the risk factor. 18.39 wonderful! I even forgot about d goat o. Na to do better yam peppersoup with the goat o. U sabi something. Person never see food chop u dey instruct am to crossover three living things with which strength??...akuko! Goat first,then come back for lion. Keep the Lion and take the goat back with me. Pick the yam and leave the goat alone,drop the yam with the lion and then go back for the goat. Take back the goat while returning. You keep the goat and cross the yam and now go back for the goat. This my Nigerian English sef! The goat will eat the yam. The lion will eat the goat. I will kill the lion and then cross the river. The lion may be weak from eating a full goat so it would be a bit easy to kill. Me and lion who go cross each other? 😁😁. Imagine, a whole lion that is not mumu will allow one out of two delicious meal to cross it. First, take the goat across the river. Then go back and take the yam across the river but return with the goat. Finally, take the goat again across the river. Why should I cross a river with these things to start with?!!! LOL. just play along, sis. come back and cross the lion. take the goat back and cross the yam. then go back and cross the goat. 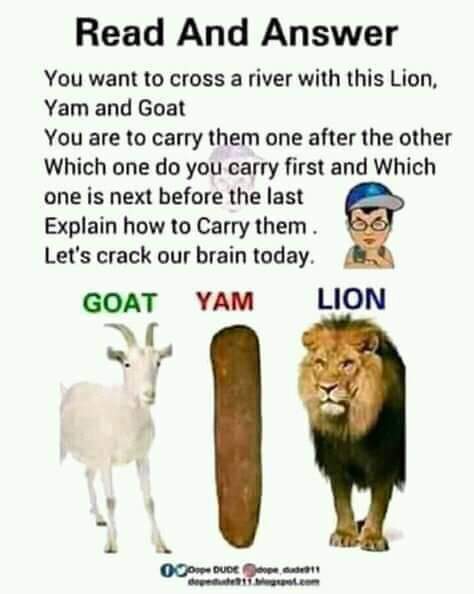 1) cross over with the goat first(because a lion cannot eat a yam)..
2) Come back and Cross-over with the yam;then bring back the goat as you are returning(because if you leave the goat,it will eat the yam)..
3) Now you have the Lion and goat together once again,then you cross over with the Lion(Lion can't eat the yam over there)..
See stress😂😂😂...except u no love yam. See plenty plenty crossovers 4 wetin na? If it is one after the other. Then first carry the goat to the other side and keep, come back carry the lion and keep, while returning to pick the yam, come back with the goat to the initial position(because if you leave the goat with the lion, the lion will kill the goat), carry the yam across and keep with the lion(since lion cannot eat yam but goat can), then finally come back and carry the goat again to go and keep. I will carry the goat first. Then i will return to get the yam. I will drop the yam on the other side of the river and take the goat back with me. Now, i will take the lion with me and leave the goat behind. Lion and yam will be on the other side while i return to get the goat. this riddle was a brain racker then.. after I knew this riddle I was able to crack a similar one without thinking much. "A man, his wife and two kids(boys) were to cross a river on a boat. Now the boat could not support above 100kg of weight, else it would sink. The man weighed 100kg, the woman weighed 100kg, and the two boys weighed 50kg each. explain how they are all to cross the river with just this one boat that can't carry above 100kg of weight. Lets ask Noah how he did it. 4. Carry the goat and cross over. I will boil the yam with the river water and make goat meat pepper soup. & run from the lion ,biko I never see man wey dey carry lion.. I will swim across the river with freshly eaten yam and goat in my stomach, hopefully the lion will cross to hoping to eat me at the other side.. But I 4 don ja by then sha..
you would hold on tight to both the yam and water (I don't know how you intend fetching it). so that after the lion is done swallowing you and the goat, you can then go ahead and make goat pepper soup with boiled yam while inside the lions belly. I will take the goat first, Lion is a carnivore, he no fit chop yam. What do you think will happen to the goat and yam you left behind? Goat wey stubborn pass anything go wait for your approval before e put yam for mouth? I will cross with yam,then lion before returning to cross the goat. All I know is the goat and yam will be for peppersoup. After eating and drinking water (far from the lion), I will cross and go my way. Anybody that can carry lion should carry. Go back and carry the lion, cross to the other side where the goat is. Drop the lion and take the goat back. Now cross with the Yam and drop it with the lion. Go back and get the goat again. Carry the goat first, leave the lion and the yam 'cos lion can't eat yam. Come back and carry the yam, drop the yam at the other side and carry the goat along with you again 'cos the goat will eat the yam. Thereafter, take the lion with you and drop the goat at the initial point, go and dropped the lion with the yam at the other side again, then finally go and take the goat to otherside. But wait can't the lion eat you???? Let the goat eat the yam & the lion eat the goat; since its belly is now full, carry the lion across and sell it at the next village. Then keep on with your journey. Come, I hope these passengers have change oh before all these carrying. If not, na to join them for Obalende.